Colorado offers a vast array of ancient and historic landmarks that are waiting to be discovered. From ancient archaeological sites to the historic towns of the Wild West, there is surely something available to satisfy even the biggest history buffs. Mining and Railroad Park. Included in this district are buildings and mining structures dated back to the Colorado Silver Boom from 1864 to 1893. Mining tours are offered for visitors throughout the year. There is also a reconstructed narrow gauge railway loop between the two towns from the 19th century. The engineering required for this railroad was ahead of its time due to the 601ft. elevation rise in 2 miles that they had to build upon. Tours are also offered on a train over the loop from late May to early October. 14ers: Blanketing the unique landscape of Colorado are the 54 14ers spread all over the state. 14ers are mountains that climb above 14,000 ft. in elevation. Pikes Peak, ocated outside of Colorado Springs is one of Colorado's most popular fourteener. Pikes reaches 14,110 feet in height and is designated as a historic landmark. The first sighting is believed to have been by Zebulon Pike, an American, in 1806. Gold was discovered there in 1858 and the newspaper started to call the gold-mining area “Pike’s Peak”. Today, there are visitor centers, restaurants and shops on Pikes Peak and has become a very popular item on the “to do” list of hikers. Other popular 14ers include Mt. Elbert (highest elevation at 14,439 ft.), Mt. Evans (you can drive to the top! ), and Longs Peak (located in the heart of Rocky Mountain National Park). 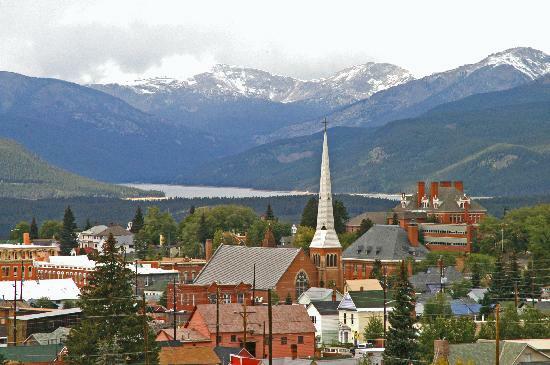 Leadville, CO: Situated at an elevation of 10,152 feet, the city of Leadville is the highest incorporated city and the second highest incorporated municipality in the United States. It was once the second most populated city in Colorado behind only Denver and is known mostly for its silver and gold mining history. More important to the present day, Leadville sits at the headwaters for the Arkansas River where some of our best rafting trips are run.